Films, books and music from around the world. The affordability of digital recording resources today has, to an extraordinary degree, democratized access to the production and distribution of sound. I’m thinking not only of those $100 synths and drum machines that, in the mid- 1980s, blasted electronic club music into orbit, but also the radical spirit of experimentalism that this freedom engendered. At the far end of this Professor Brainstorm inventiveness lives Hyperpotamus. Hyperpotamus is a young Spanish musician who gets by on voice alone. Really. It might seem that the colliding rhythms that make Delta so punchy are the product of a cache of beefy drummers. But, like the urgent chants, skittering high-end noises and deep swells of melody, everything on the album was produced by a few microphones, a loop pedal and layers upon layers of unaccompanied vocal. This isn’t a new technique (Björk’s Medulla album took multi-tracking to innovative levels), but Hyperpotamus does some extraordinary things – not least with a truly big voice that flies over the hubbub below. Separate from the mode of Delta’s production is the music itself: sometimes a raw protoblues, sometimes a syncopated funk, but always expansive, with plenty of lyrics and melody. 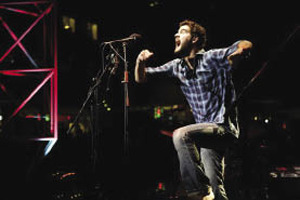 One-man bands don’t come more interesting than this. Inana, the ancient Mesopotamian deity of love and war, was not a goddess to be messed with. 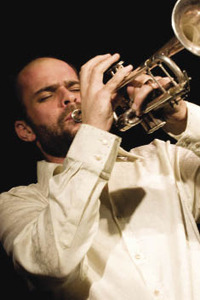 And Amir ElSaffar, a trumpeter of Iraqi- American heritage, while pushing all the boundaries, shows a similar veneration for the way two musical cultures can come together. This is ElSaffar’s second album to explore the nodal points between jazz’s microtonal possibilities and Middle Eastern maqams (scales). But whereas 2007’s Two Rivers was a tentative dip into these waters, Inana is full immersion. ElSaffar’s trumpets, vocals and santour (hammer dulcimer) lead, but don’t miss some fantastic oud work from Zafer Tawil and spiralling sax melodies from Ole Mathisen – both from the Two Rivers quintet – here too. The bulk of this album is given over to the ‘Inana Suite’, a musical journey through various aspects of the legends attached to the goddess. Her paradoxical qualities – love and war – are explored via two different maqams. ElSaffar’s vocals appear for the first time on ‘Journey to the Underworld’, a 15-minute section capped by the stately resolution found in the subsequent ‘Venus, the Morning Star’. ‘Al-Badia’, the only piece on the album outside the Inana music, is an accessible work for muted trumpet, richly sonorous bouzouk and percussion. It is quite lovely. 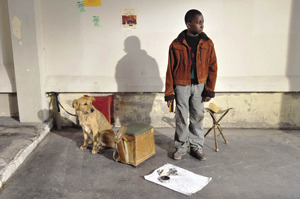 Offbeat, good-natured comedy in Le Havre. directed, written and produced by Aki Kaurismäki What if most people were thoroughly decent and did what would be for the best, not what follows from self-interest or social role and position? Marcel is a failed writer, whose wife is ill, who earns very little as a shoeshine man, but whose local grocer and bar-keeper let him have everything on tab. When Marcel comes across Idrissa, a boy from Gabon hiding from the police under a pier and who asks him if he’s arrived in London, Marcel gets him a baguette. Later, Marcel and his good-hearted neighbours help him hide until they can get him across the Channel to his parents in England. Kaurismäki’s droll, stripped-down, deadpan style sets up a modern-day fairy story where what goes around, comes around. A man handcuffed to a suitcase of money gets run over, but at least he’s paid to have his shoes shined. A detective in classic Clouseauesque raincoat and trilby trails around looking for Idrissa. Is he a typical duty-bound police officer? He goes into a bar and sits contemplating the pineapple he’s just bought. Maybe he isn’t. If you see this offbeat, very good-natured comedy, you’ll find out. directed and co-written by Nuri Bilge Ceylan This is a film about a killing, which happens off-screen, and which we never get to see. It’s about the police investigation, but when there’s a confession of guilt, noone hears it. We learn about the lives of several men, and for each of them a failed relationship with a woman is defining. Women are at the heart of their lives, but only two women fleetingly appear, and only one woman ever speaks, and then only a single word. It is, though, a film of many conversations; mostly at night between men inside a car. When they stop, two of them, a chief prosecutor and a uniformed police officer, bark orders to juniors in another two cars. They are searching for a place near a well where the arrested man says he has buried his brother. In a monotonous landscape, and at night, they drive around till dawn. It’s not a film with a conventional story. It’s about absence. The absence of what really matters in our lives. It’s a Chekhovian road movie where the journey is all. The film’s point of greatest selfdisclosure is also the most uncomfortable and threatening, but it leads to an act of great humanity. This is engrossing and subversive filmmaking of the very highest order. A profound, magnificent film!